We survived our first season racing with the Desert Dingo class 11 team, and we had so much fun that we're back for more crazy races! 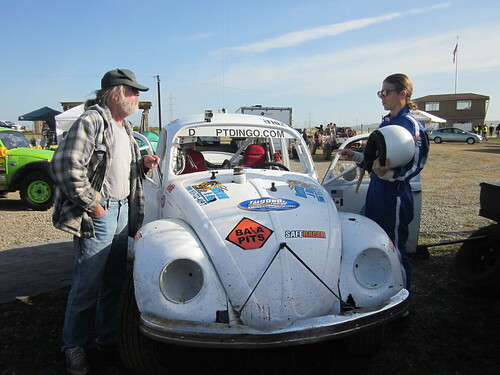 This weekend's double header at Prairie City SVRA started off the 2012 VORRA racing season. VORRA stands for Valley Off Road Racing Association, and they run off road races near the Sacramento and Western Nevada areas. Romy talking to Melissa, a news reporter from Good Day Sacramento. The race weekend started off really wet and muddy. It just kept raining and raining and raining, since earlier in the week! The rain didn't stop until Saturday morning. 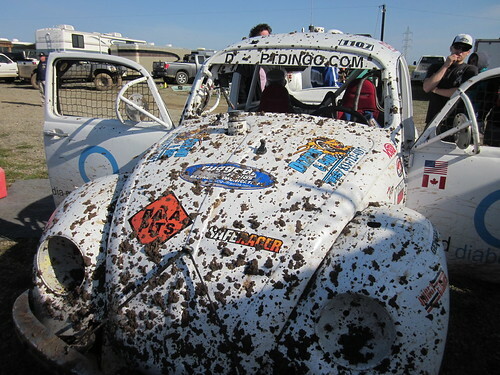 Many days of rain left the track so muddy that VORRA decided to cancel the first day of racing (Saturday), which defeated the whole thing about the race being a "double header." But instead, they decided to pack in a whole bunch of races the next day. The course at Prairie City is very short (about one or two miles), so that meant a lot of motos could be scheduled in one day. Unfortunately, the more races you pack in, the less time we have for fixing the car between races! So with Saturday a bust for racing (the VORRA volunteers spent the whole day pushing mud around the track in hopes it would dry out faster), we spent it getting some last minute work done on the car, and of course, some relaxing! 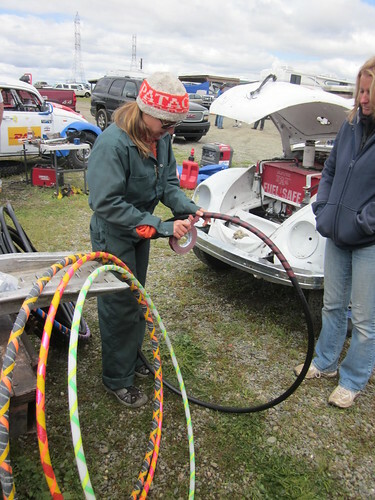 Lynda showed me how to make hula hoops, and we got to meet some of the new people on the team this year. Debbie and Dennis from baja Mexico came out (who are building their own class 11 car in Mexico and will host us if/when we go down there for the Baja 1000 race in November), and so did Danielle, who will do logistics (I think, but I'm not exactly sure). That morning, the news reporters from Good Morning Sacramento came out to interview some racers, and do a race car engine symphony. Romy and I got to rev the engine and sound the horn for Saturday morning's live show! It was fun! Romy's new (old) racing helmet! Towards the afternoon on Saturday, the sun started shining and everybody's hopes went up for the next day of racing. We got together with some other class 11 teams and did a huge potluck for dinner. A French team from San Francisco cooked up some crazy good beef stew and passed around a huge carrot cake. Mmmmmm. And Crusty gave Romy his old racing helmet, so now Romy has his own helmet! Yay! The racing helmet is not like a motorcycle hemlet, although it kind of looks like one. It has an electrical connection to plug into the car's radio so you can hear inside of the helmet. It also has a microphone so you can talk through the radio too. And the helmet also has an air hose connection for fresh air can be pumped inside. Its really nice to have fresh air, especially when it's hot, because the helmet is all sealed up otherwise when the visor is down. Crusty and Romy getting ready for a practice lap. 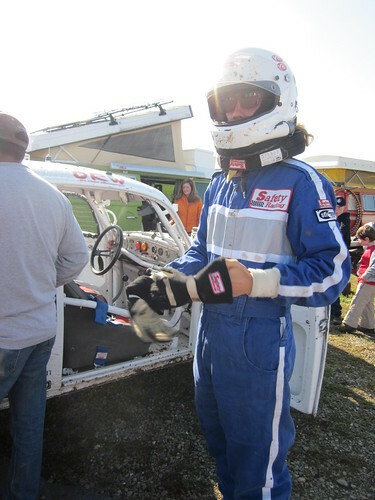 Romy getting ready to race! 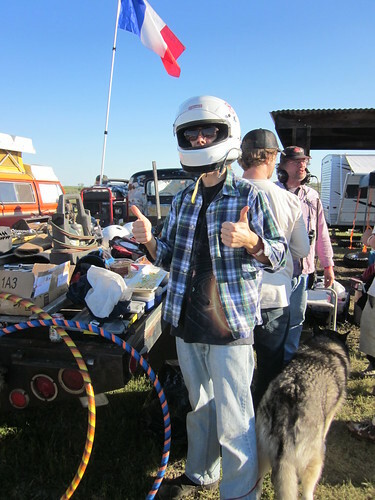 We did most of the 5 motos that day (or 6? I don't remember), however, I don't think we finished a single one. Each moto had 12 laps, but I think the longest we made it was about 5 or 6 laps. The belt kept popping off because the pulley was a little crooked. We couldn't fix it at the race because we didn't have another one. When Romy and I drove one of the motos, we had to stop because the belt just ripped up on us! We couldn't keep driving without the belt because the belt is what spins the fan, and it's an aircooled engine. The radio wasn't working, so nobody even knew our problem, so nobody from the team replaced it at the pits so that we could go back out again before the moto was over. Needless to say, we had a bunch of glitches that day. It was muddy out there! At some point between motos, we realized that the exhaust wasn't properly tightened to the heads, which was one of the reasons we were having a loss in power and the engine didn't sound right. After we fixed that, we were ready to get back into the race. However, halfway through another moto, the spindle broke and we lost the rear driver's side wheel! The tow vehicle took the car off to the side of the course, but by the time we could survey the damage, the moto was over. 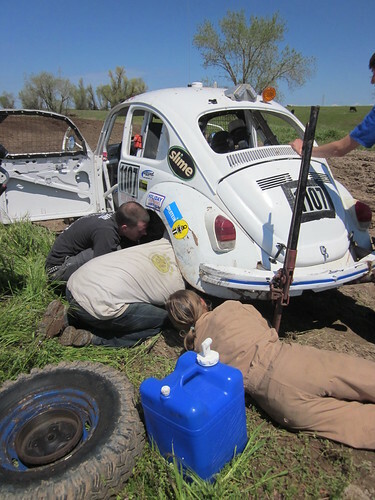 We used the break between motos to get another spindle on there and drive the bug out of the mud (hey at least we fixed it!). It required a lot of hammering, and me running back and forth through the mud to get the right tools from the pits. I almost lost a shoe! If only the radio was working. . . .
We got stuck on the track after our wheel fell off! Anyway, even though we had a whole lot of mishaps, we did finish a few laps, which was important. Every lap you finish gets you points for the season. Sometimes winning overall is just about who manages to show up and finish as many laps as you can (for class 11 anyway). We don't necessarily go for speed! It is a VW, after all. Better luck next time!